I am trying to implement WP_List_Table for my plugin. I have gone through this tutorial and using its sample plugin. 'ajax'     => false //does this table support ajax? * Delete a customer record. * Returns the count of records in the database. * Render a column when no column specific method exist. * Columns to make sortable. 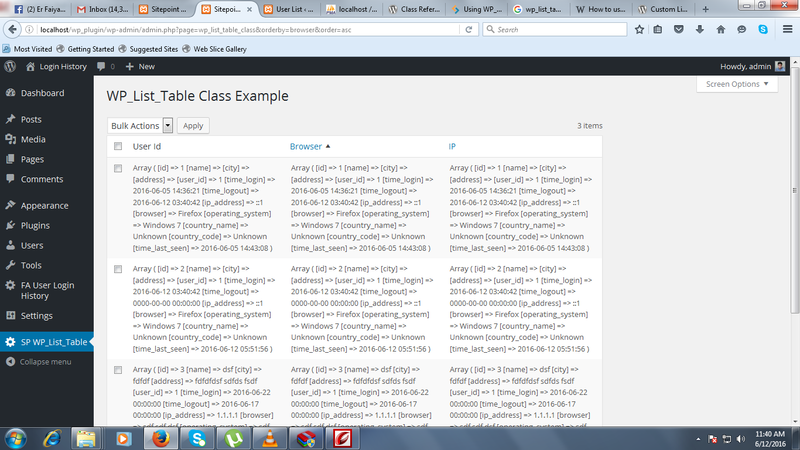 * Handles data query and filter, sorting, and pagination. // In our file that handles the request, verify the nonce. // esc_url_raw() is used to prevent converting ampersand in url to "#038;"
Not the answer you're looking for? Browse other questions tagged php pagination mysql table wp-list-table or ask your own question. How-to implement admin Ajax inside an admin WP_List_Table? Custom WP_List_Table: How to create an unapproved row? How do I add a WP_List_Table to WordPress page? How to change primary column in \WP_List_Table?